Story continues from previous post about the battle of Weichselmünde 1628. Now we take closer look at the Finnish infantry present at that battle. The sources are the same, Hakkapeliittain Historia II by Arvi Korhonen (1942) and Pohjan Prikaatin Historia by Stig Roudasmaa (1984). Alexander von Essen’s infantry regiment was formed in 1626 as a result of king’s military reforms: in Finland, three large landsregements were divided into smaller, more numerous regiments, themselves organized after new Dutch model. The new länsregements were clearly provincial in character, even though during Gustavus Adolphus’s time they were not yet officially named after their provinces but after their colonel. The von Essen’s regiment was reqruited from Ostrobothnian province and later came to be called the Ostrobothnian Infantry Regiment, with province’s coat of arms in its flag. Ostrobothnia province (Pohjanmaa in Finnish, Österbotten in Swedish) is in northwestern part of Finland, the eastern shore of the Bothnian Gulf: coastline of fishermen’s villages on the islands and small towns trading furs and tar, and flat inland part with wealthy and rebellious peasantry. 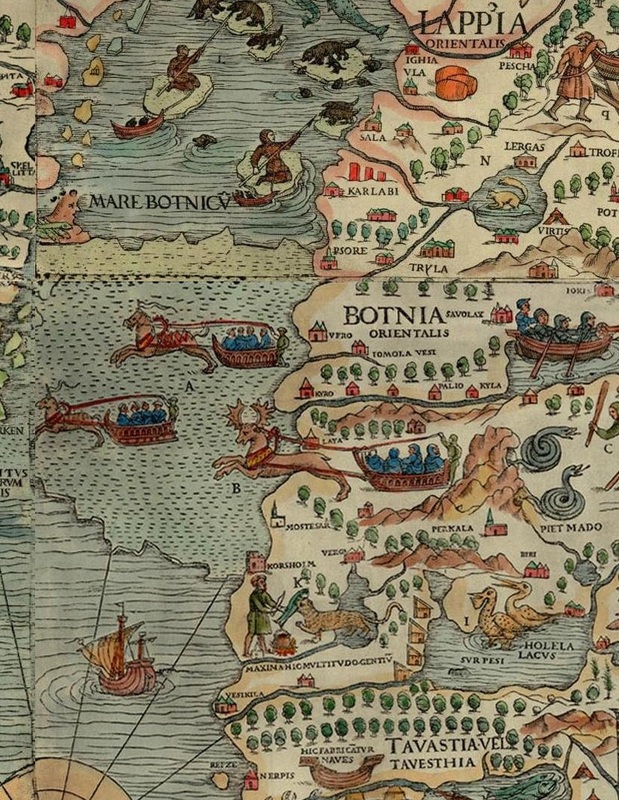 Botnia Orientalis in Olaus Magnus’s Carta Marina from 1539. ”They build ships here” written near Närpes. During 17th century, not much unlike today, the coastal villages of Pohjanmaa were predominantly Swedish-speaking and the inland Finnish-speaking. So also the von Essen’s regiment was bilingual with some companies, like Colonel’s and Major’s, drawn entirely from coastal villages and thus Swedish-speaking in character, while von Falkenberg’s (later Hume’s) company was made of men from the Finnish-speaking areas like Ilmajoki and Laihia. Lichton’s regiment was drawn from extreme north part of the province, Kemi and Ii areast that reached far into the wilderness that is modern Lapland. And to add to two native languages, there were the multinational officers, with names like Suther, Lichton and Hume (Scots) and Schultz and von Falkenberg (Germans). There were also several native Swedish officers and some Finns too. The commander of the regiment, Alexander von Essen, was himself a Baltic German from Estonia. Before becoming commander of the Ostrobothnian regiment at the age of 31 years, he had already served in Prince of Orange’s lifeguard and in Venetian, Spanish and Polish armies. The regiment was first gathered in one place at 27.7.1626 in the city of Turku, Finland. There were 1123 men waiting for ships to take them to Prussia and to war. Equipment was lacking, most of the men were dressed in their own clothes, in Finnish peasant style that was not suitable for parades. Many were unarmed. In the last minute the regiment received a shipment of hundreds of muskets and pikes and several hundred meters of cloth for new uniforms. Also new flags were received, 24 infantry flags for two regiments (the other was Horn’s regiment). Too bad we don’t know what those flags looked like! 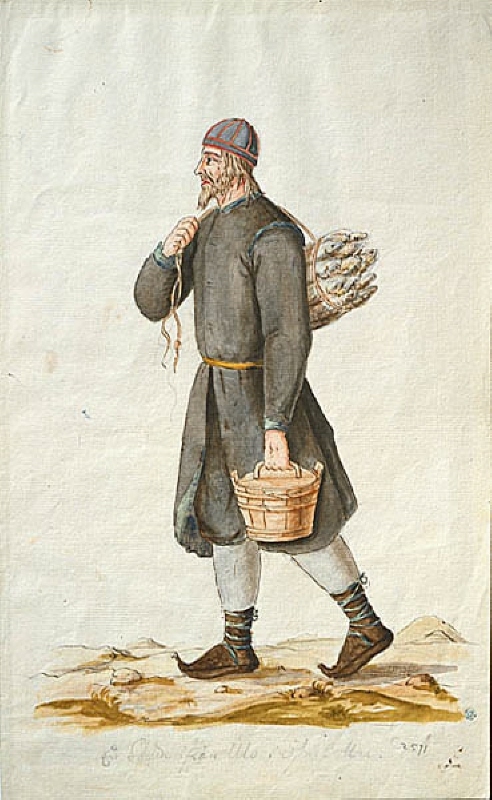 Folk Costume of a Peasant from Österbotten. Anonymous watercolour, end of 17th c. Nationalmuseum Sweden. We can assume that the clothing situation improved during the war and by 1628 the regiment was mostly dressed in military fashion instead of peasant clothes. At least the hardware was fine: from the beginning of August 1627 we have list or regiments weaponry. The whole regiment had 485 muskets and bandoliers. Most companies had full 72 musketeers but two companies had only 42. Every company had full 54 pikes, 432 in total. Every pikeneer had an armour (steel harness) and a helmet, also about one quarter of the musketeers had a helmet too. There was a sword virtually for every man, 1024 in total. On the summer of 1627 the regiment had around 1050 men, but at least 150 of them were ill at any given time. For almost the whole duration of king’s Prussian war the von Essen’s regiment was part of the field army while the other Finnish regiments were garrisoning Livonian castles and cities. So amongst Finnish infantry units the von Essen’s unit was the one that saw the most action in the campaign – a similar role the Hastfehr’s Savolax infantry has later in the German campaign. Only Finnish infantry unit in the field army was von Essen’s regiment. Even though the foreign infantry regiments were probably more presentable than the Finnish regiment, it was still seen strong enough to be the main body of king’s daring secret attack on Polish and Danzig fleets in the end of June (look at the previous post in the blog). Every summer a new conscription run was made in the homeland and the regiment was reinforced with 437 new recruits in the summer of 1627 and 304 men in 1628. They were shipped to Prussia in small groups, some boats sailing from as far as Oulu (Uleåborg). The boats were not warships but small, locally-made one or two-masted cargo ships called kuutti/kreijari or skute/krejare and leased from the burghers of coastal towns. It took at least a month to sail from Oulu to Pillau and it was probably not a pleasant experience for new soldiers. Apparently all ships and most of the new soldiers made their way to Prussia safely. After the sea journey they were free to start dying from diseases. In the first two years of the regiment lost 254 men, around 20% of its original strength, most of them to diseases. This does not include the new recruits that also of course also died in droves. The actual fighting killed less than 100 men.